Occupational therapy is a dynamic, growing healthcare profession that helps people to maintain, or regain the skills required for the “occupations” of life! Occupational therapists work with people of all ages in a range of settings such as their homes, the community, hospitals and schools. For example, physical or emotional challenges can interfere with the ability to participate in tasks of daily living such as work, play and leisure, self-care or caring for others. As an occupational therapist you will help people to enjoy life to its fullest as you help them participate in the job of living. Occupational therapists have always incorporated creativity, flexibility and problem-solving skills to help people find practical real-life solutions to the challenges they are facing. If you possess those qualities and are looking for a career that allows you to apply them to help people participate more fully, occupational therapy may be the profession for you. The School of Occupational Therapy admits approximately 40 students per year. 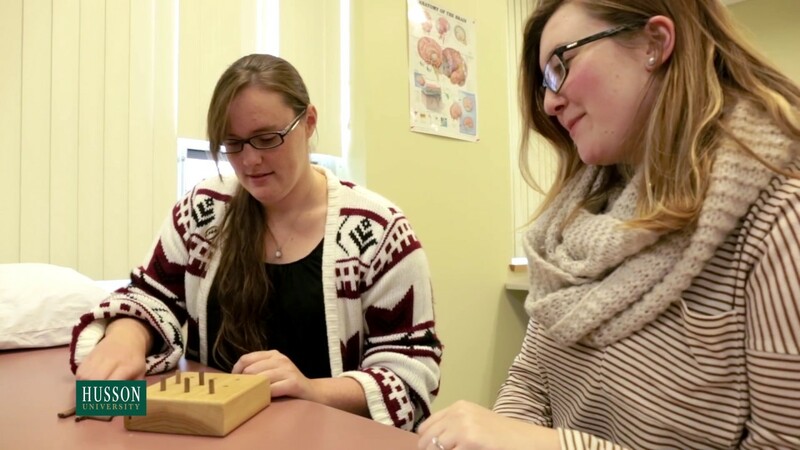 It is considered an entry-level Master's program, leading to the Master of Science in Occupational Therapy. The facilities at Husson University include a designated occupational therapy lecture and lab, a cadaver dissection lab, excellent library resources and wireless computer access. We are committed to providing a premier education for students enrolled at Husson. This commitment is reflected in the mission statement and educational goals that guided and directed the development of the course of study. Educational Goal 1. Provide a learning environment that ensures the development of professional and personal leadership skills and values grounded in ethics and self-reflection. Educational Goal 2. Promote best professional practice by developing students’ appreciation of health, wellness and meaningful participation in life through occupational engagement within and across diverse contexts and environments. Educational Goal 3. Foster the development of evidence-based critical thinking and clinical reasoning in support of life-long learning. Husson University offers multiple entry options for students wanting to become an occupational therapist. The BS/MS program awards a BS in Healthcare Studies and an MS in Occupational Therapy. 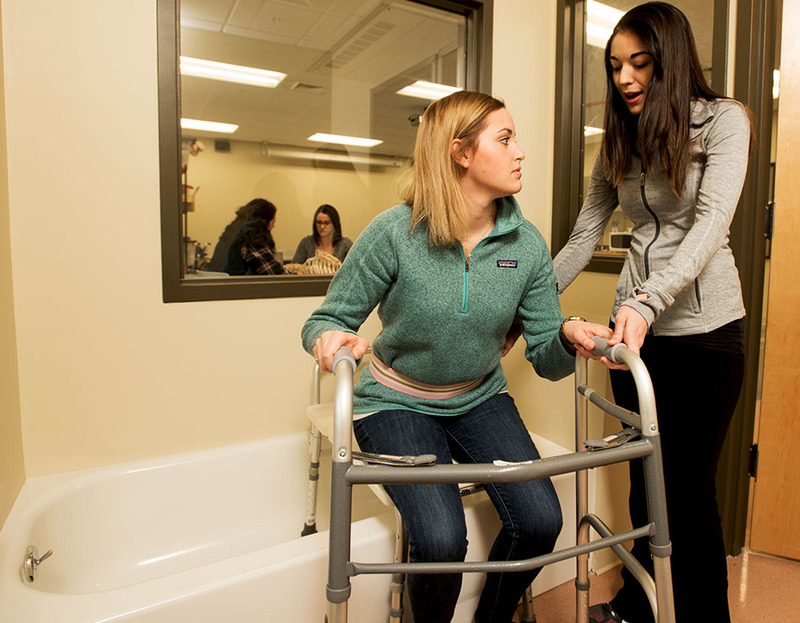 First-year Husson University students can enroll directly into the BS Healthcare Studies – Occupational Therapy track; in the third year they are eligible to progress into the professional phase of occupational therapy coursework. The BS in Healthcare Studies is awarded after successful completion of four years of study; the MS in Occupational Therapy is awarded after successful completion of the fifth year of study. Students currently enrolled at Husson University can apply to transfer into the program from another major within the first two years of general undergraduate study. Students from another institution may also apply to transfer into Husson University. Transfer students must meet the same criteria for grades and GPA as students who are enrolled from the first year and will be expected to fulfill the requirements for the BS in Healthcare Studies. Finally, we also welcome applicants who have completed a 4-year undergraduate degree in another major and/or from another institution and would like to obtain an MS-only degree in occupational therapy. These students do not need to meet the undergraduate general education requirements as they already have an undergraduate degree. All MS-only students must, however, still meet the required prerequisite core courses and also meet the same criteria for grades in core courses and overall GPA as all other students in the occupational therapy program. Please visit the MS-only webpage for information about the curriculum and course descriptions for MS-only students by clicking here. Once you graduate with the MS in Occupational Therapy, you will become eligible to take the National Board for Certification in Occupational Therapy (NBCOT) examination. Their address is: One Bank Street, Suite 300, Gaithersburg, MD 20877-4150 (301) 990 7979. After successful completion of this exam, you will be an Occupational Therapist Registered (OTR). Click here to see Husson University's NBCOT examination pass rates. Most states require licensure in order to practice, however, state licenses are usually based on the results of the NBCOT examination. Please be aware that a felony conviction may affect a graduate's ability to sit for the NBCOT examination or attain state licensure. Accreditation is provided by the Accreditation Council for Occupational Therapy Education (ACOTE) for the American Occupational Therapy Association (AOTA). ACOTE is located at 4720 Montgomery Lane, Suite 200, Bethesda, MD 20814-3449; the telephone number, c/o AOTA, is (301) 652-AOTA. ACOTE’s web address is WWW.ACOTEONLINE.ORG.